It’s that time of year when leaves don their colorful hues, the wind turns nippy, and children everywhere are preparing for Halloween. For many families, this can be a fun holiday where everyone can dress up in fun costumes and carve pumpkins. Children, of course, are excited about receiving free candy, but for some parents, there is the small fear that their children may end up getting a trick instead of a treat. Allowing youth to walk up to homes where people they may or may not know can sometimes damper the spirit of this season. For this reason and many others, families have been flocking to Momentum Church in Crown Point, Indiana for their annual Trunk or Treat. This will be the third year the young Church of God located about an hour outside of Chicago has hosted the Trunk or Treat, which has grown larger than they had ever expected. A month before the church was going to be launched (November 2, 2014), Pastor Charlie Arms sat down with his team to discuss how they could reach out to the community and spread the word about their church. It was decided that due to the time of year, a Trunk or Treat would be perfect. This event usually consists of church members decorating vehicles and passing out candy to children from the trunks of their vehicles. This team of twenty-nine people decided to rent a pavilion by the Lake County Fairgrounds and brought in a few bounce houses. They assumed there might be a couple hundred people attending. Banners were hung around the fairgrounds, and about forty dollars went to Facebook advertising. 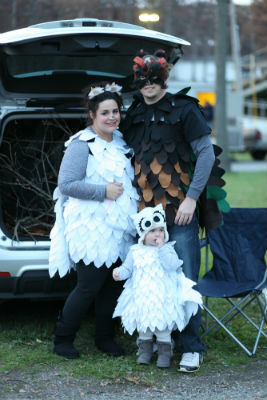 With only two-and-a-half weeks of promotion, their first-ever Trunk or Treat attracted three thousand people! 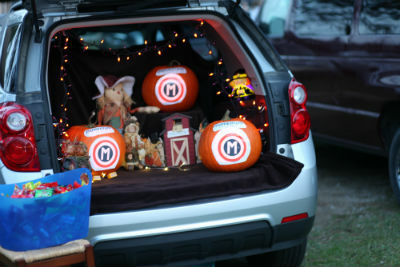 Photo: Ready to minister through Trunk or Treat! Pastor Arms believes that their Trunk or Treat was so popular because “people normally have to drive around from community to community in order to score a few pieces of candy. Kids have to walk busy streets and face the hazards of public safety…Trunk or Treat allows families to have a safe place to do their holiday activity. Also, we don’t focus on fearful or scary themes, but fun and positive ideas.” Many other activities have been added to the event after that first year in addition to the candy. There are bounce houses, “bubble soccer,” and a stage with live entertainment. This year, a few local dance teams will perform between the live shows. Because of the vast growth of this event, Momentum Church has opted out of the typical face-painting and costume contests that could never accommodate the size of the crowds. However, they have partnered with food vendors, businesses, and nonprofits such as the American Legion, emergency management, and the county sheriff’s office. This now regional event grew even larger last year when over twenty thousand people showed up for this free, family-friendly event! Pastor Arms admits that crowd management has been the toughest part. “This event is something you would expect a church of 2,000 to put on, so stretching our team to make this happen has been amazing. It speaks to the amazing determination and dedication of our team to make it happen. This has made strategic partnerships with other local organizations highly important.” The American Legion helps with parking and the sheriff’s department provides security. It was hard for Momentum Church to limit this wonderful outreach, but the extreme numbers made it hard to adequately connect with each visitor. This year, Trunk or Treat will be a ticketed event limited to 6,000 people. Proceeds of the ticket sales will fund many local missions such as Mommy’s Haven, Northwest Indiana Cancer Kids, and Kid’s Alive. The hope is that this event will increase the church’s ability to give back to the community and meet some very important needs. Above all, this has proved to the Momentum Church congregation that God can use anyone to do big things. For a portable church that meets in a school, the community has come to love and appreciate how they support others in this great event. Momentum Church is thankful for all of the partnerships that Trunk or Treat has formed, and they look forward to many more sweet years of ministry. This entry was posted in All Church of God, Great Lakes and tagged Charlie Arms, church plant, Crown Point, Halloween, Indiana Ministries, Momentum Church, northern Indiana, outreach, Trunk or Treat. Bookmark the permalink.